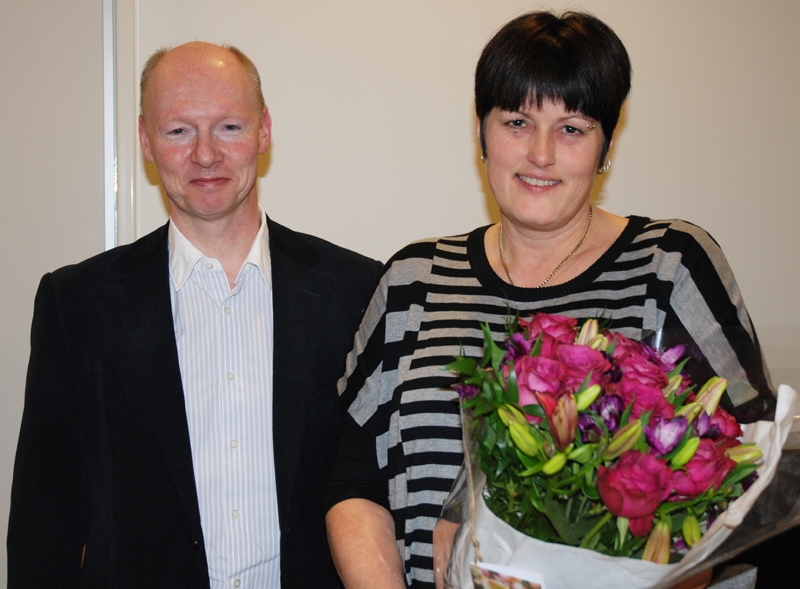 Kjersti Flatmark from the Department of Tumor Biology is awarded the 2013 "Dr. Ragnar Mørk's legacy prize" for her excellent research achievements. This annual prize of NOK 200.000 is awarded to a scientist at the Norwegian Radium Hospital who has obtained important results within the field of cancer research. The ceremony took place on Friday November 15th in the Research Building at Montebello. Flatmark gave a lecture about the research activities that has earned her the award. For 2013, Dr. Ragnar Mørk's prize for excellent cancer research has been awarded to Dr. Kjersti Flatmark, Department of Tumour Biology, Institute for Cancer Research, for her groundbreaking research on cancers in the gastrointestinal system. Dr. Flatmark has been interested in two main aspects of cancer research, namely cancer prognosis and therapy. In particular, she has identified several proteins and microRNAs that are promising candidates for prognostic markers in colorectal cancer, and she has been pioneering studies on histone deacetylase (HDAC) inhibition in combination with palliative radiotherapy in gastroinstestinal carcinoma. Flatmark has published 48 papers since the start of her research career in 2000, several of these in leading journals. She has been able to form a strong research team at the same time as she has been working as a clinician in 50% position. Her contributions to the scientific activities at the Institute for Cancer Research make her a worthy winner of the 2013 Mørk prize.